Karin Linder has been a visual artist most of her life. 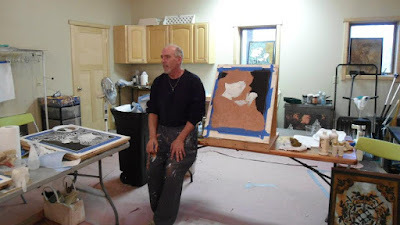 An early interest in drawing and painting became evident at a young age. Creative parents encouraged her developing talent by taking her to museums and art-auctions while growing up in the Midwest. Travel to Europe to visit relatives and vacation allowed her to experience the Old World first hand. While in high school, she painted sets for drama-club plays and took as many art classes as possible. Later on, her first job was painting stage sets for local community theaters where Linder learned how backdrops and walls provided endless opportunities to define space. Linder earned a Bachelor of Fine Arts degree from Wayne State University in Detroit, Michigan in 1979. She constantly experimented with different paint mediums as well as printmaking, mixed media (using wood and fabrics) and collage. The use of color and paint built up over layers and worn away imagery became recurring themes in her work. Linder supported herself by teaching art classes to students in public schools. She organized and exhibited in several group and solo art shows, always managing to get favorable attention in the press and selling just enough to keep her motivated and optimistic. Linder moved to New York City in 1982 at the age of 25. She took a job sign painting, learning old techniques such as gold leafing, gilding and hand lettering. During this time, she discovered the collection of frescos and hand-painted period rooms in the Metropolitan Museum of Art, which were new sources of inspiration. Linder loved how visual artists decorated walls, creating dramatic and subtle effects. Using Europe as her inspiration, Linder recreated the faded patina of elaborate Italian frescoes on the apartment’s living room walls. 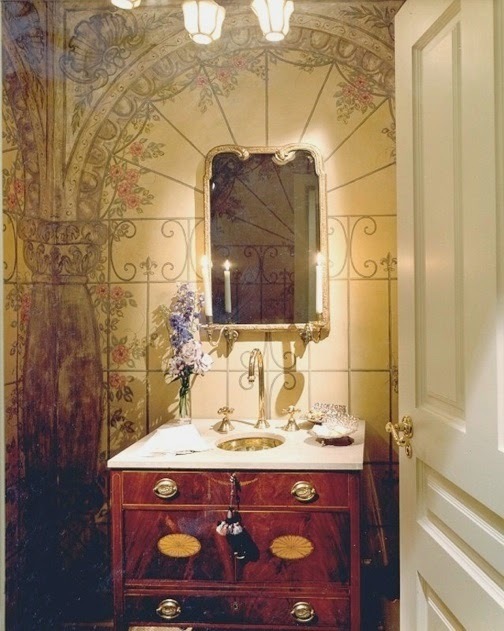 Clever and delicate trompe l’oeil designs around the center fireplace and mirror above created a provocative focal point, reminiscent of the 18th century. The staircase was painted the patina of weathered copper. 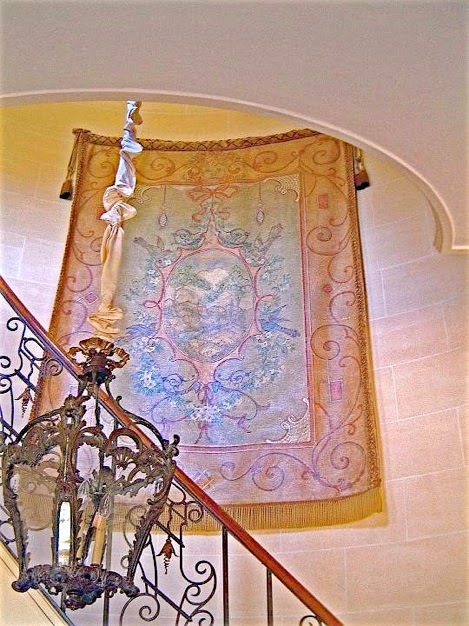 The master bedroom was covered with panels containing scroll motifs and floral designs taken from an antique Aubusson rug. 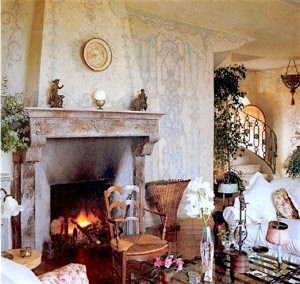 Burn complimented this by hanging endless yards of antique lace around the windows and canopy bed as well as by adding off-white linen slipcovers. The second bedroom became a nursery, where the entire room was painted as a tented fantasy of adult-sized animals dressed in elaborate costumes dancing around the four walls in an “animal’s ball.” This complete transformation of an ordinary apartment into a “Villa in the sky” was an accomplishment of grand illusion. Linder and Burn continued to work together to create serene and calm retreats in the midst of Manhattan’s concrete reality. 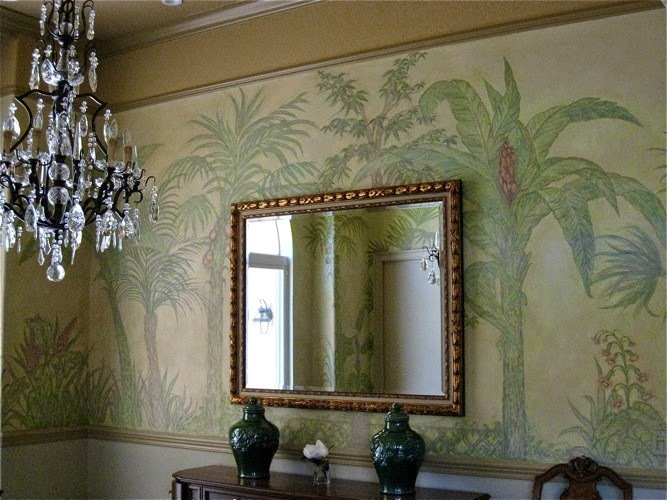 Their widely imitated interiors of fantasy and magic have graced the covers of magazines and publications both in the US and abroad and inspired the shabby-chic style.” Linder’s murals and fresco-like finishes appeal to a sophisticated clientele. Nature, the supreme colorist is a continuing source of inspiration to her. She prefers muted hues to primary colors and is a master at mixing and matching complex colors. Travel, especially to Europe, continues to offer inspiration. Some of her favorite sites are the Palazzo Vecchio in Florence, the Villa Kerylos and the Lacaris Palace in Nice, the city of Venice and the endless magnificent chateaux, castles and churches throughout France, Italy, England, Germany, Spain and Sweden. Photos taken during her travels along with a collection of patterns, drawings and stencils serve as an invaluable visual resource for her work. Linder works with a handful of designers who use her talents time and again. She also works directly with individual homeowners whenever possible. Linder’s portfolio of work is extensive. New York continues to be her home base. She is carrying on a centuries old tradition of decorative painting; from Egypt and Pompeii to the courts of the nobility and the itinerant art work of a young America. Linder views her painting as silent poetry that continues a long history of artists enhancing our quality of life through the beautification of living spaces.